Have an inspiring business or personal story to tell? Share your story and we'll publish it for FREE! Dr. Daniel Calva is currently focusing on hand and breast reconstruction. He does a unique procedure that is not done in most parts of the world. The most successful results are from reconstructing the breasts with your own tissues, and Dr. Calva uses tissue grafts to reconstruct your breasts, which is a different approach. The results are excellent, as well as aesthetically pleasing. This is done by performing liposuction followed by gently harvesting skin grafts from the patient. The grafts are injected into the breast, dispersing it one drop at a time. This maximizes the blood supply to the grafts, and increases the survival rate of the graft. This procedure is a great choice for reconstructive breast surgery, for example, after breast cancer. It is also used for people who have other breast congenital issues and need reconstructive surgery, and for those who do not want foreign material in their body, such as silicone. The procedure can also be used for people who want to remove implants and want a natural replacement while retaining shape and contour of the breast. In addition, since he uses liposuction to obtain the tissue grafts for the breast, the patient actually receives two or three procedures for one. Body sculpting is a wonderful byproduct of this unique way to perform breast reconstructive surgery. Dr. Calva also focuses on hand reconstructive surgery. If your hand has been injured, he can perform reconstructive surgery to repair the hand. Dr. Daniel Calva also does other aesthetic surgeries, which includes repairing areas where tissue may have been scarred in the past and have disfigurement. However, his main focus is breast and hand reconstructive surgery. This is his specialty. 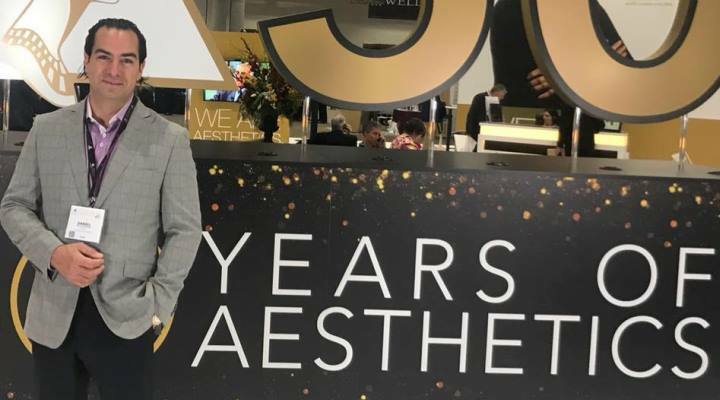 Dr. Daniel Calva attended Johns Hopkins for plastic surgery education, which is a progressive program offering the best education in the world. During his time at Johns Hopkins, the first-hand transplantation occurred there, through the Wounded Warrior Program. This was an excellent way to restore function of the hand through a hand transplant so the soldier would have a better quality of life. Dr. Calva then joined the Miami Breast Center and the Miami Hand Center, with Dr. Khouri, who pioneered the unique breast reconstruction method that they continue to perfect. He has dedicated his career to breast and hand reconstructive surgeries. Dr. Daniel Calva is married and has three children, one son who is five and two daughters who are three and one. He spends most of his spare time helping his wife with their children! He also enjoys painting and sculpting and he has created a beautiful collection in his home. In addition, Dr. Calva likes to play soccer, tennis, and golf. Why did you choose to become a doctor? My mother and father are doctor’s, which seems to run in the family. I tried to fight it and started taking some business classes at Georgetown, but the medical bug drew him away and he became a pre-med student. I migrated to surgery because I am a hands-on kind of guy. I am also creative, which pairs well with the action-oriented branch of reconstructive and plastic surgery. I am always seeking innovative ways to perform the surgery and assist my patients. Many outside of the box thinkers and artistic-minded Doctors migrate to this kind of surgery for their career. I started with General Surgery with a special study in molecular genetics, trying to identify cancer genes in patients for early screening. I mapped genes in different families, as well as published my work in that field. After General Surgery, I went to Johns Hopkins for Plastic Surgery, and now I am at the Miami Breast Center and Miami Hand Center. What area do you specialize in? I specialize in Breast and Hand reconstructive surgery, as well as many cosmetic procedures. What is your daily routine? It depends on the day, they are never the same! Monday I could be doing a facial reconstruction after cancer has been removed. This often involves getting creative to hide the scars while retaining function and aesthetics. Some days I may do a couple of facelifts, and I may see patients in between for a consultation for breast reconstruction. Tuesdays I have my hand clinic and I may see 60 to seventy patients. Wednesday is also OR day for hand or breast reconstructive surgery and occasional aesthetic patients. Thursday and Friday are our heavy breast reconstruction days. And of course, I am on call at the hospitals for hand, facial, or general plastic surgery about three to four weeks per month. I leave home by seven in the morning and return sometimes around ten or eleven at night. I think it is the entire spectrum of disease that we see, taking care of the patient to improve their bodies. Helping the patient have confidence in their appearance using surgery is a very rewarding part of my job. I really enjoy the reconstructive surgery aspect. If someone, for example, had a failed plastic surgery and is very unhappy, we pride ourselves on performing our unique surgical method to fix the previous work someone had done. It is life changing for some, as it can eliminate something they do not like or eliminate a disfigurement they may have. I enjoy restoring hand functionality and aesthetics to the hand. If the hand or fingers have been amputated, we can reattach them, keeping the patient’s hand mobility. I also enjoy helping my colleagues in general surgery with patients that need their abdominal walls reconstructed after large hernias have been fixed. I also help reconstruct patients who have had cancer removed from the perineum and buttocks and I can perform reconstructive surgery to repair the area. The challenge is to always think ahead. Every patient is different and I want to use the best technique for the reconstruction since each procedure needs to be applied different to each patient. You have to think outside the box! What do you do in order to mentally separate yourself from your job? Once you find something you love to do, like I have, you do not feel like you are working. The work can be stressful, so I take a deep breath and move forward. What is most important is the patient. When the day is over, I leave everything at the hospital or the office and come home and enjoy the family, that way you do not get drained. After all, there is always tomorrow. What would you consider to be the greatest accomplishment in your career? I think that if you look at the opportunity I had to train at the best places in the world, Georgetown and Johns Hopkins, that is an accomplishment I am proud of. There are so many applicants per year and out of those they choose me. I have the discipline, work ethic, and the ability to perform what needs to be done at a high level. Much of this has been instilled in me by my parents as I was growing up. I am also proud of the innovative procedure for reconstructing breasts, as well as continuing to find ways to further perfect the technique. I will say, that after all that, my biggest accomplishment is being able to create three wonderful children with my wife. How do you unwind after a particularly stressful day? I come home, see my family and give them kisses, read to my kids, and spend time with them until they fall asleep. Then I have a glass of wine with my wife and catch up on the day. That really helps me unwind and get ready for the next day. I like to always be in touch with my family and never let go!